Brighton Pier are launching a creative photographic competition with the aim of capturing the essence of Brighton Pier as you see it. The organisers are asking you to focus your lens, put your finger on the trigger and take a unique snap shot. Let your imagination run wild and capture the essence of Brighton Pier. Whether it be a lazy day on the deck chairs, the thrill of the rides, or a seagull stealing your freshly cooked chips. There is £500 worth of camera equipment up for grabs for the first prize winner and two runner up prizes of your image printed onto a canvas. 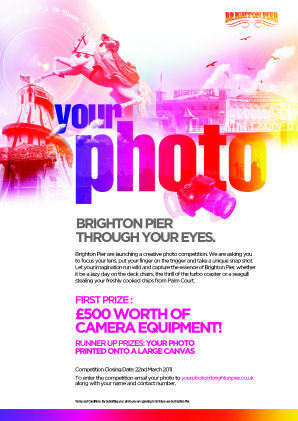 The competition will be judged by a panel that includes a Brighton photographer as a guest judge. The competition closing date is on the 22nd of March. To enter the competition please email your photo to yourphoto@brightonpier.co.uk along with your name and contact information.